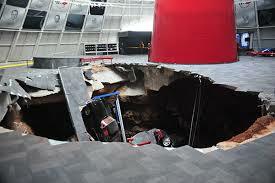 Say it isn’t so – a giant sinkhole under the National Corvette Museum in Bowling Green, Kentucky, USA has opened up and swallowed eight historic and valuable Corvettes. Two of the eight cars were on loan from General Motors. You know that you are talking about an interesting automobile when the “big-boys” decide to keep it for themselves. 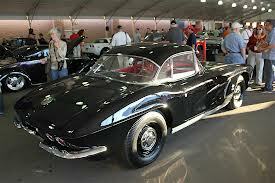 The other six Corvette models were rare historical and commemorative edition autos. Bowling Green, Kentucky is home to the Bowling Green Assembly Plant where Corvettes have been manufactured exclusively since 1981. The giant sinkhole, which is estimated to be 40-feet in diameter and 25 to 30-feet deep, opened up under the museum’s Sky Dome area early Wednesday morning February 12, 2014. While the extent of the damage to the Corvettes is not fully known, early reports do not look promising. Here is a look at some of the irreplaceable automobiles which were damaged as the earth opened up and claimed her bounty in priceless sports cars. The first car, owned by General Motors, is a 1993 ZR-1 Spyder. This car was for static display purposes only, which loosely translated means that it had no running gear. It was never actually produced; nevertheless its estimated value is well over $1-million. 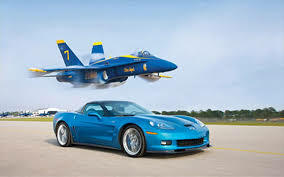 The other vehicle owned by GM is a 2009 Corvette ZR1 Blue Devil, which features a 7.0-liter supercharged V8 that generates 650hp, will bolt from 0 to 60 mph in only 3.5-seconds, and has a top speed of 215 mph. 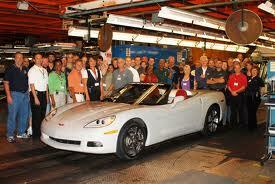 By using carbon-fiber body panels, Chevrolet reduced the curb weight of the ZR-1 by over 300-lbs. when compared to a standard 2009 ‘Vette. 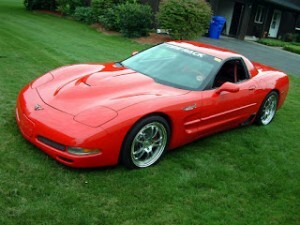 A total production run of only 1,415 ’09 ZR1s make this a very rare and very fast Corvette. It is also estimated to be worth over $1-million. 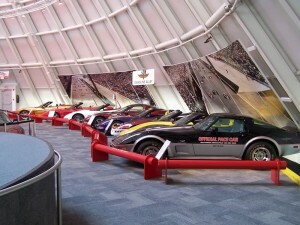 The remainder of the cars are owned by the National Corvette Museum. Most of them were donated by Corvette enthusiasts who will be contacted individually because of the sensitive nature of this news. The 1962 Chevrolet Corvette Hardtop Coupe was affectionately known as the “Mako Shark.” This model featured the recently redesigned engine configuration; going from a 283-cubic-inch to a more powerful 327-cubic-inch. While available engine options stopped with the 327, two different performance levels were available. Standard equipment was a 340hp unit, while an optional 360hp enhanced version was also available. I can give you three guesses as to with which engine this Tuxedo Black show-piece was equipped. 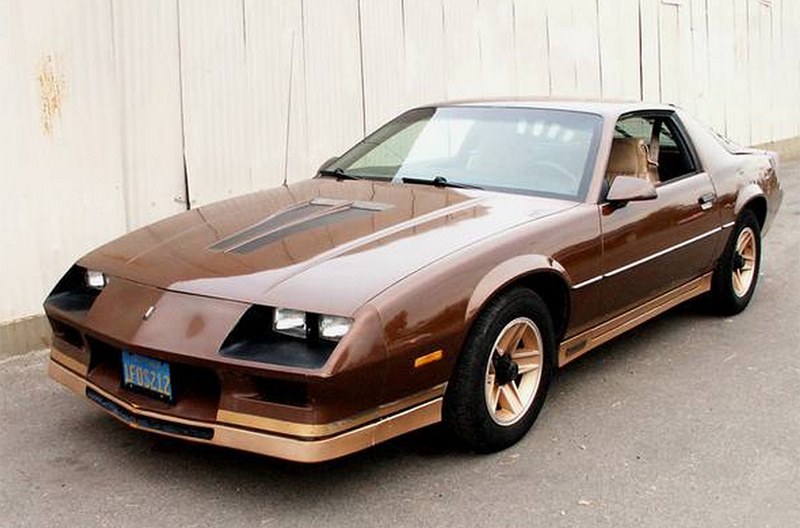 A pristine 1984 Chevrolet Corvette PPG Pace Car was also lost. This era of Corvettes was lackluster in the performance department but these pace cars could still draw a great deal of interest from a historical standpoint. Standard equipment included a 5.7-liter V8 detuned to produce only 205hp and 290 lb.-ft. of torque. This car can never be realistically replaced. 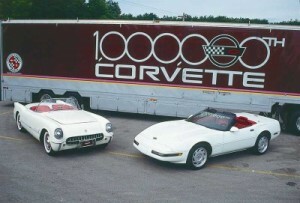 It is a 1992 Chevrolet Corvette, Polo White in color, and it is the 1-millionth Corvette ever produced. For 1992 the Corvette was starting to regain some degree of respect from a performance outlook as Chevrolet rolled out the 1-millionth production unit. It is outfitted with an LT-1 5.7-liter V8 engine that manufactures 300-base horsepower and 330 lb.-ft. of torque. 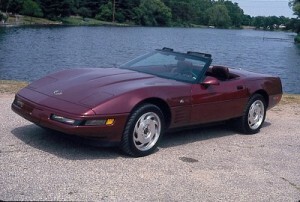 The 1993 Chevrolet Corvette was available with a special 40th Anniversary package. Option coded RPO Z25, it featured stunning Ruby Red paint, matching leather seating, 40th Anniversary commemorative wheel center caps, and special 40th Anniversary badging. The headrests were also specially embroidered. A total of 6,749 ‘Vettes were ordered with this trim package. The 2001 Chevrolet Corvette Z06 Mallett Hammer version is nothing short of an all-out racing car. It has been specially modified by Mallett Cars Limited and is outfitted with so many performance and competition upgrades that I could write another article about this single car (and I just may). The interior has a full racing roll cage, the factory Z06 option involves massive horsepower but this car boasts 525hp and 500 lb.-ft. of torque from a naturally aspirated 5.7-liter V8. Wow, what a terrible loss. 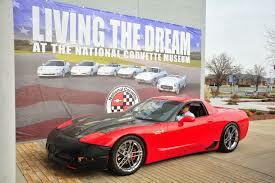 This commemorative 2009 Chevrolet Corvette represents the 1.5-millionth production unit for this beloved car-line. By 2009 Chevrolet and the Corvette were starting to reemerge as champions of horsepower, again. Painted in beautiful Polo White, inspired by the very first Corvette produced in 1953, this is a convertible car. Standard equipment under the hood includes a 424-horse 6.2-liter naturally aspirated V8 engine. This is another car that can never be replaced. Despite the fact that we, as automobile enthusiasts, feel sadness because of the events which have damaged these fine priceless automobiles, only time will tell if any can be restored. One thing is for certain, regardless of whether or not these cars can be put back together, their value has been forever impaired. CRAIGSLIST FINDS: Cars Of The Year – Where Are They Now?